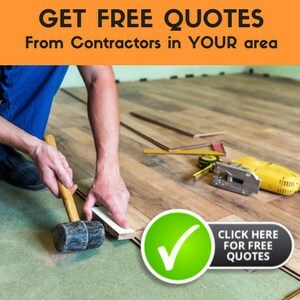 The best part about laminate flooring is that it is easy to handle and, with a little bit of help, you can install it yourself. There are a lot of people who do their laminate flooring on their own with minimal additional help. There are numerous guides and how-to articles on what you may need to do the installation yourself. However, installing laminate flooring on your stairs is a completely different matter. You need to take care of the treads, risers and stair noses, which can get a bit complicated at times. You have to ensure that there are no gaps and spaces in the flooring and it is complete and perfect in every way. If you have been wondering how to install lamiante flooring on stairs, you have come to the right place. Before we begin, let us try and understand some major components that make up a typical stair. The Tread: This is where you walk on (see image below). 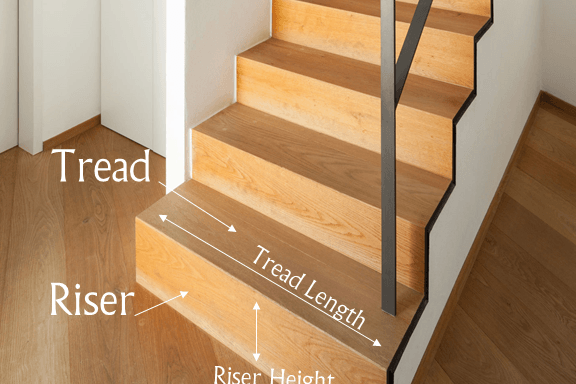 The Riser: The part from the tread to the stair noise is called the riser. It is vertical in shape. 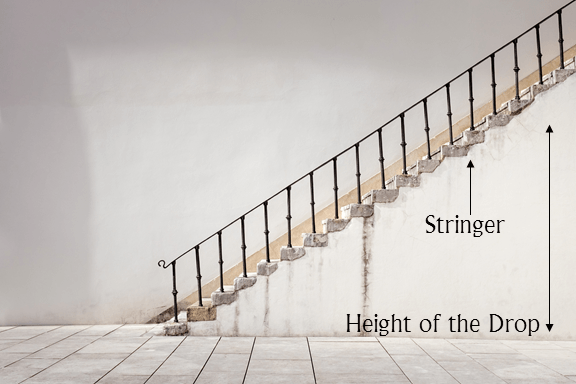 ​The Stringer: It is what is on the wall along the stair. The Stair Nose: This is where the riser meets the tread. Old installations may not have it, however it is very important to have one these days. Now that you have a clear understanding about the different components of a stair, let’s get to installing a laminate flooring on it. 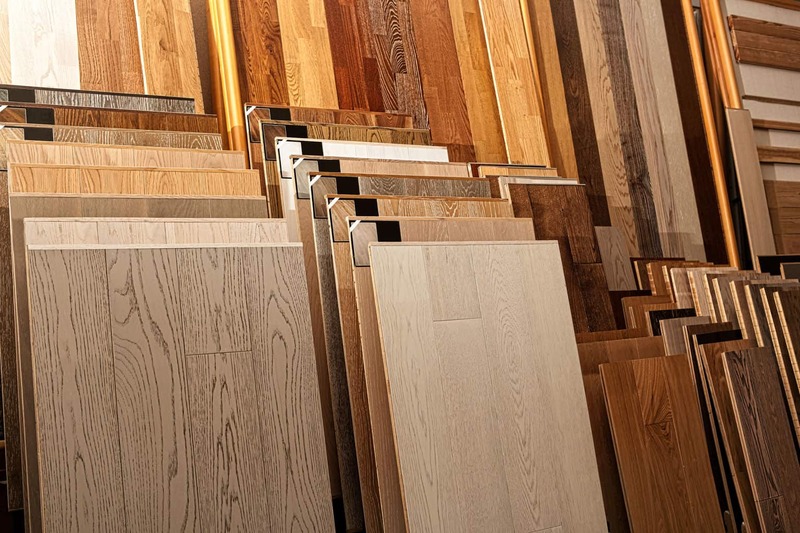 There are certain things that you need to keep in mind while choosing laminate flooring for your steps. 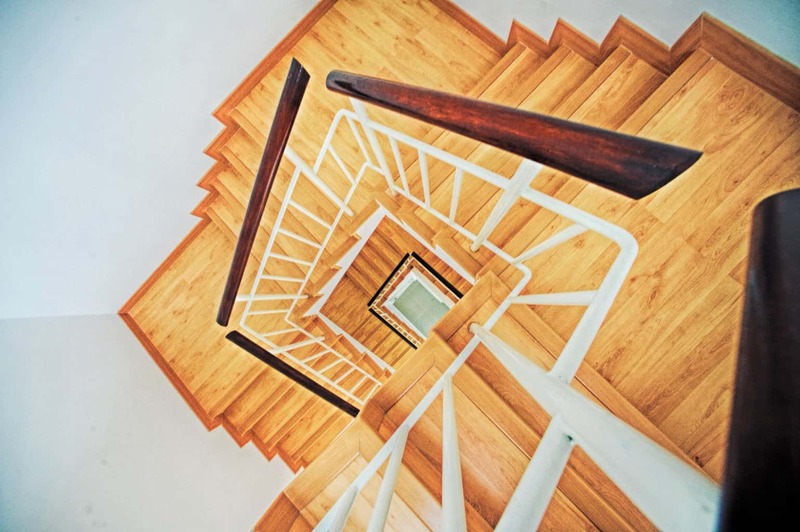 Unlike the bedroom or living room, a staircase is frequently used and is subject to faster wear and tear. Hence, you need to make sure you purchase high quality flooring for the stairs. Also, you do not need it to be glossy and slippery, especially when there are young children in the house. Therefore, buy laminate flooring that is of high quality and has a textured matte finish. Just like hardwood flooring, laminate may also expand or contract depending on the temperature and humidity in your home. 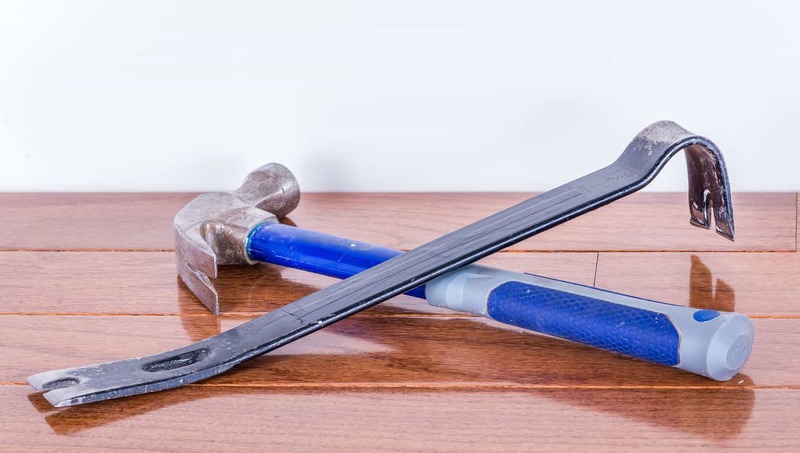 You do not want that happening after the installation of the flooring, which is why you need to give it a couple of days to acclimate to your home conditions. After it is delivered, you may stack it outside and leave it there for about two days. 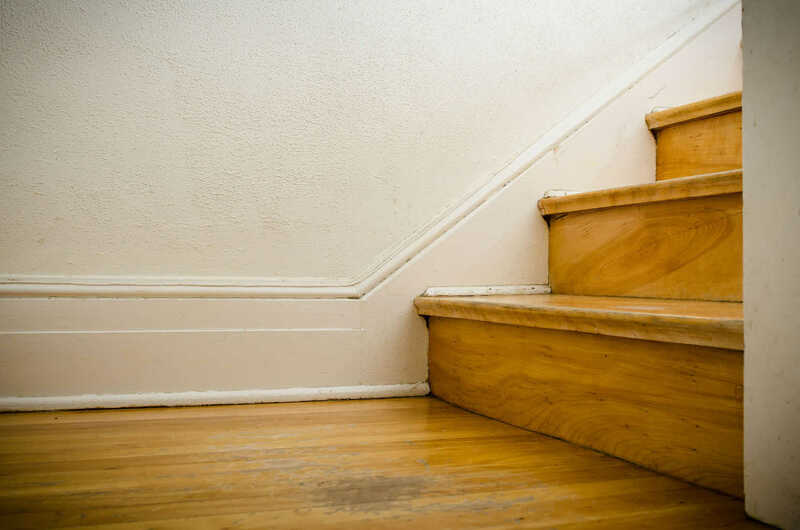 You most probably already have carpet on the stairs and, understandably, you need to remove it before installing the laminate flooring. You also have to remove the numerous staples and tackstrips holding it. 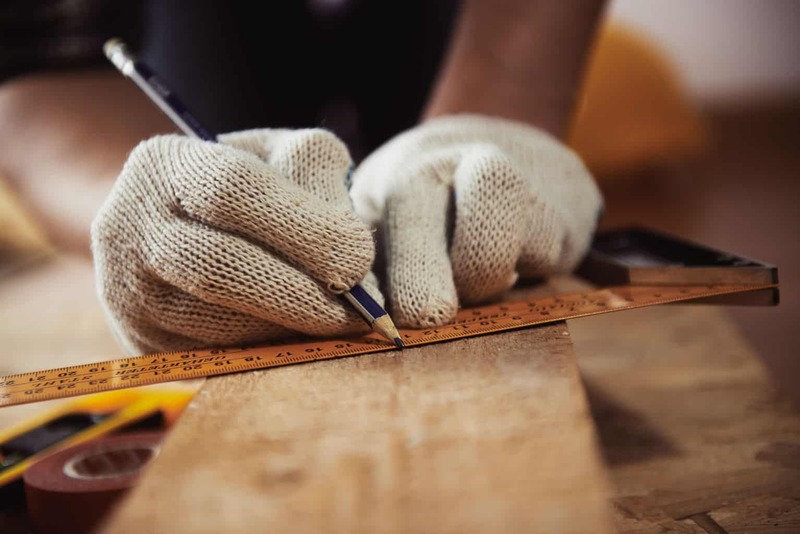 Protect your hands using gloves during the removal, as there is a very real chance that you might be injured by the staples. Before you finish, make sure the steps are even. If they are not level, you will need to level them out. If you already have an over hang, it is better to remove it prior to installation. It will give the stair a better finish and it is better to replace the current one with a laminate over hang. There are numerous ways it can be removed. Using a jig saw or reciprocating saw are two of the many options. This is where you cut planks for the tread, risers and stair nosing to length. For the tread, you may need to place the laminate plank on top of the stair to get an exact fit. If one plank doesn’t suffice, you may have to cut and join another one. Next, you can cut the riser pieces similarly. The only difference here is that the riser is vertical. Place the plank against the riser for a better measurement. This should be followed by the nose stripping. It would be a good idea to mark the stair number on the planks themselves in order to avoid confusion later on. The stair nose needs to rest on the riser, which should be cut flush with the surface. Start your installation at the top of the stairs, for the simple reason that you can avoid standing on freshly installed flooring that way. This will also help you to have all the tools right next you, so all you need to do is take them one step down with every step you complete. Use a good quality wood glue to stick the tread pieces on the stairs. Make sure you do not apply any glue where the stair nosing would be installed later. If you observe any glue gushing after placing the tread, quickly wipe it off and prevent it from seeping on to the nosing area. The installation is similar to the tread pieces, the only difference being the installation would be vertical here. Also, after placing the wood plank, do not let the glue fall on the installed tread pieces. If you feel it requires more support, you can always use a nail gun to attach it firmly on the top. Allow sufficient time for the tread and riser to fit in. Then, apply some glue to the sub floor and press the nosing firmly on to it. To give it more support, you can screw the top nosing in as well. A lot of people prefer completing all the risers and treads first before starting on the nosing, because it can be a bit complicated. Others prefer finishing the whole set of tread-riser-nose first before moving on to the next. There is no recommended method and it can be done however you see fit. Again, start at the stop of the stairs. Fill all the screw holes with matching putty. Leave it for 30 minutes and then wipe off the extra putty with a damp cloth. Sweep away any sawdust and make sure there is no putty left on the stairs. Once it dries, it can be extremely tough to get rid of. Once all this is done, it is recommended to leave it for at least a day so that everything fits in perfectly. Make sure no one uses the stairs during this time. After the 24-hour setting time, you may use your newly installed laminate flooring on your stairs. My wife and I have been wanting to get some laminate flooring installed, and I think that knowing how to do it on the stairs would be helpful! I’m glad that you talked about being able to have the risers installed right with laminate flooring and how they should be vertical. I’m going to have to make sure that our laminate flooring gets done right so that it looks good, especially on our stairs! Thanks for the helpful tips! where can you get a double Bull nose starter step tread for stairs? ?